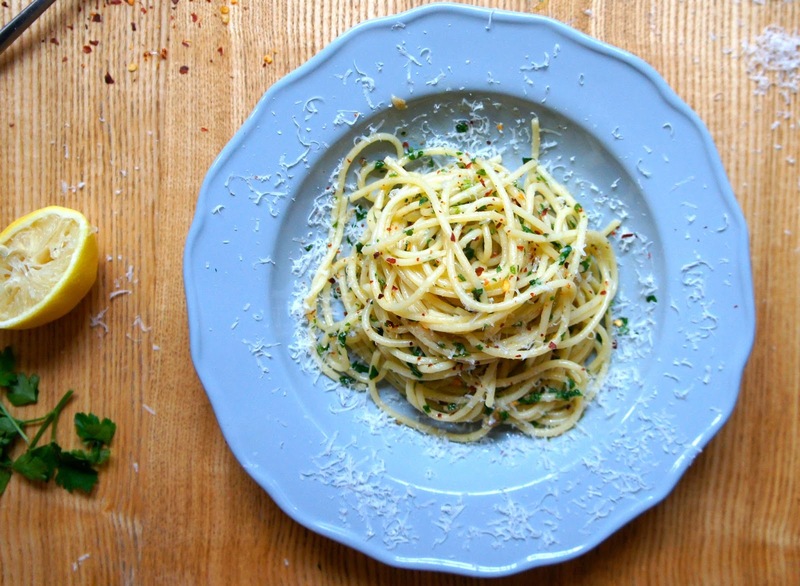 Pasta with garlic and olive oil, a gorgeous traditional pasta dish from Napoli. Also the pasta dish that Jon Favreau uses to seduce Scarlett Johannson in ‘Chef’. If you haven’t seen the film, you must. It is happy, food-filled, music filled and just lovely in all ways. So back to the food. My curiosity stung me when I saw the dish in the film, thinking it looked ridonkulously easy and delicious (and it made Scarlett swoon), so I sought it out and made it. I’m happy to report that it is very much both of these things (still awaiting feedback from Scarlett), and is now a staple go-to at home. Generally everything I need is already in the larder (I say larder but I live in London so this means very small cupboard), and the dish takes about 15 minutes to make. Max. 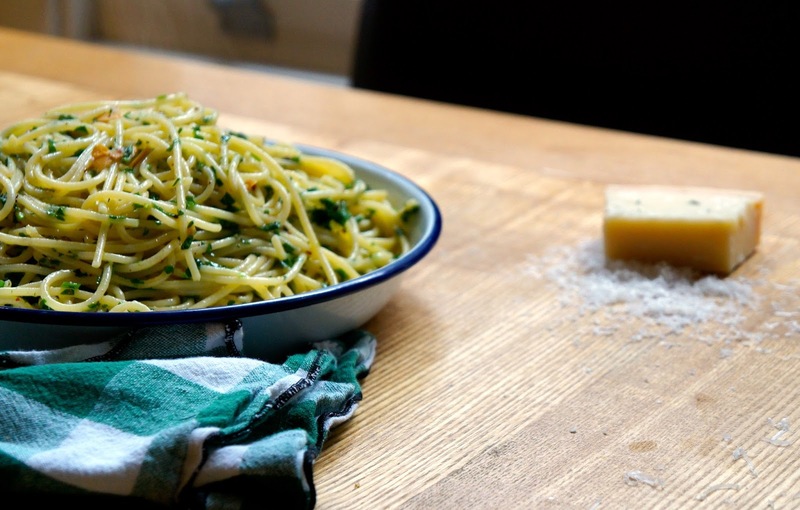 I almost feel guilty sharing such a basic, easy recipe but you know what – you’re going to thank me for it once you’ve made it once a week for the next year. You’re welcome in advance. Every version is a little different from the next and that is part of it’s beauty. 1. PASTA: Boil a large pan of salted water and add the spaghetti. Cook until al dente (usually around 8 – 10 minutes) and drain. 2. GARLIC & OIL: When your pasta has about 5 minutes left before it’s ready, start to heat your olive oil in a large pan over a medium heat. I use a wok. 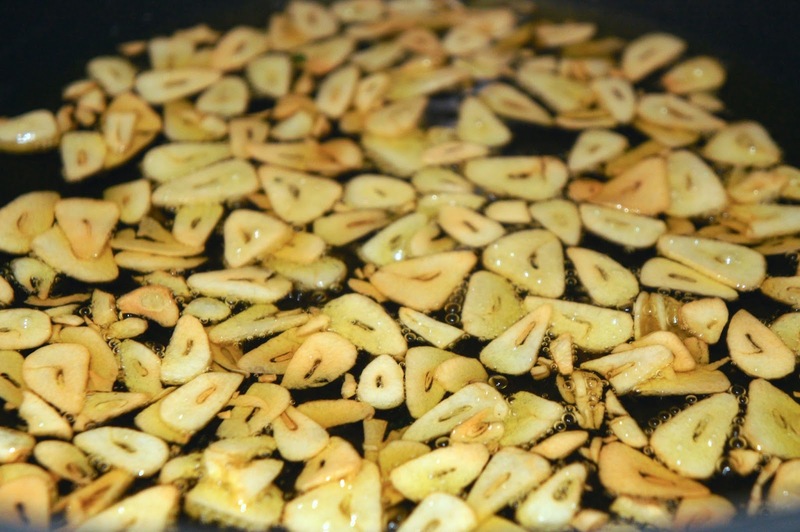 Add your garlic slices and stir frequently for a few minutes until the garlic is just starting to get golden brown. Add your chilli flakes, salt and pepper. Tip: When the garlic starts to brown, it will go dark very quickly. You want to achieve a light golden as the garlic can taste bitter when it’s burnt. Turn the heat down low or off just before the garlic is at the perfect golden colour, as it will keep cooking in the oil. 3. 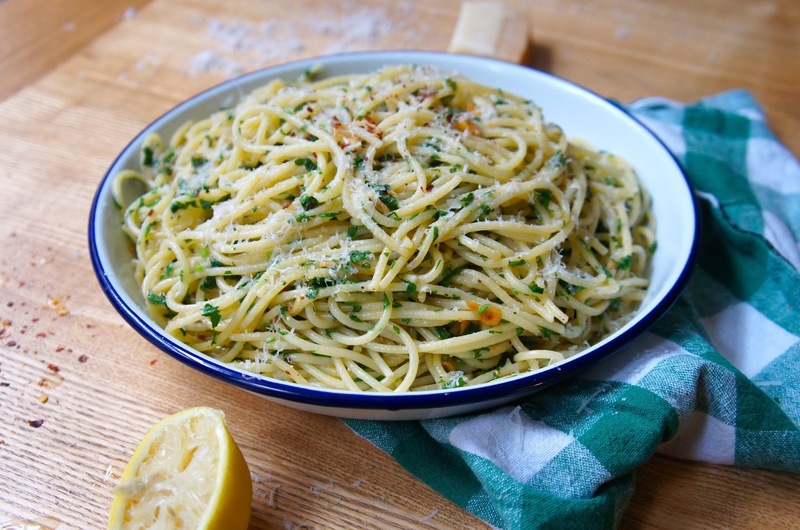 PARSLEY & PARMESAN: Add the drained spaghetti to the saucepan with the oil and garlic. 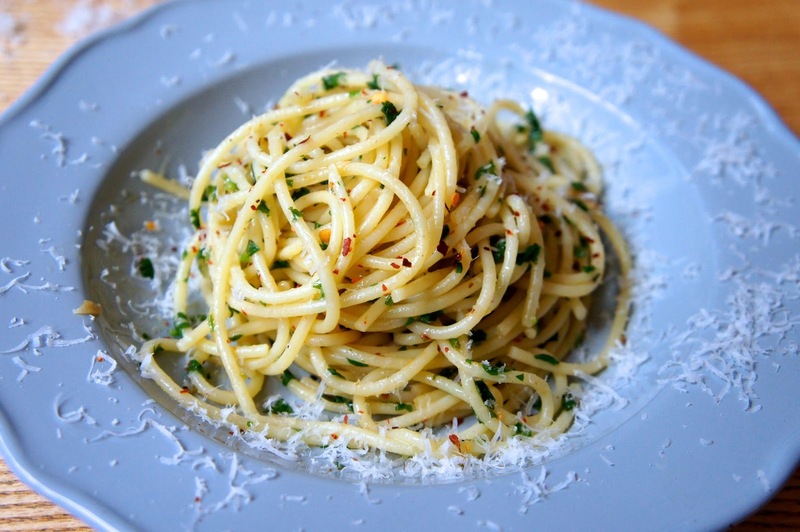 Toss until the spaghetti is completely coated with the garlic oil. 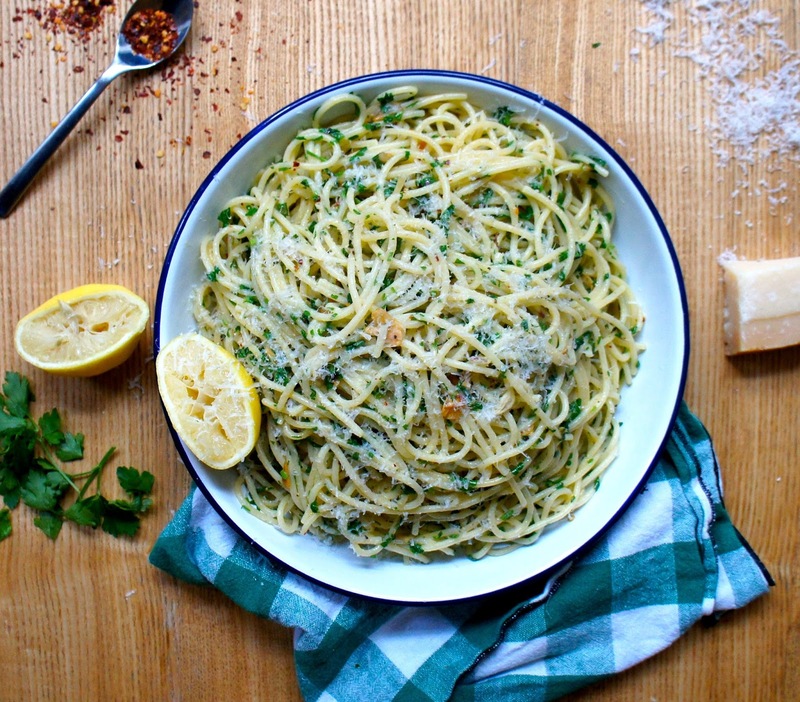 Remove the pan from the heat and add the parsley and Parmesan. Toss well. 4. SERVE: Finally, have a taste and season some more with salt and pepper if necessary. 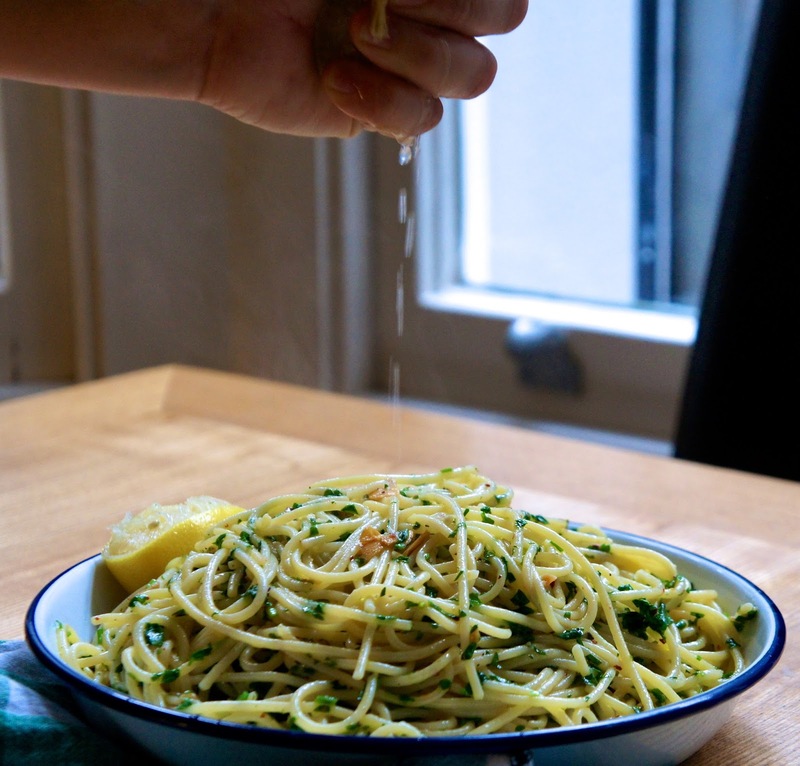 Squeeze over some fresh lemon juice and grate over lots of extra Parmesan. Serve immediately.